Despite the fact that my weekend was pretty busy, I managed to find the time to make a nice breakfast. I have been enjoying pancakes for breakfast on the weekends recently and this weekend apples were on my mind. I was thinking that pancakes with apple pie flavours would be great! I decided to go with a healthier recipe and made the batter with whole wheat flour and ground up rolled oats. While I was thinking about oats my mind wandered to apple cinnamon oatmeal and apple crisp with a rolled oat topping and I thought why not add some whole rolled oats for some additional texture? Speaking of texture, I wanted there to be nice big chunks of apple in the pancakes so I added some sliced up apple. I also wanted to maximize the apple flavour so I added some apple sauce. It was the perfect excuse to make some more roasted apple sauce . Of course I could not forget the cinnamon and I rounded the pancakes out with some ample syrup. But I did not stop there; I also topped the pancakes off with some caramelized apples and maple syrup. The apple and cinnamon oatmeal pancakes topped with caramelized apple turned out great! The were nice and moist and light and fluffy and good! I really liked the chunks of apple in the pancakes and the overall texture of the pancakes was rally nice. These pancakes were definitely full of apple flavour. I can’t wait to make these again! Mix the flour, rolled oats, baking powder, baking soda, salt and cinnamon in a large bowl. Mix the maple syrup, milk, egg, butter and apple sauce in another bowl. Mix in the rolled oats and apple. These look fantastic and I just bought some real maple syrup here in Oz, plus would like to make a higher GI brekky, so will invest in some wheat flour too. This is a really good looking and might I say a very healthy looking breakfast, or If your anything like me it could also be a dinner. Oh wow Kevin! You never fail to impress me! Delicious! mmmmm. apples and cinnamon are such a natural and wonderful combination. I LOVE that you put oatmeal to them. it sounds like such a wonderful addition! Scrumptious!! Glad you had time to make these!! Those look outstanding, Kevin! I’m usually too lazy to make a fancy breakfast, but this is really tempting me! My husband is the one who makes breakfast on the weekends, so pancakes are his forte, not mine. I am guessing that each bite of yours was a bit of heaven! This looks like such a hearty and complete breakfast. Fruits, Whole Grains, Dairy, it’s all in there. Can’t wait to experiment with these this weekend. They sound great and decadent without being bad for you. These look amazing. I have been trying to replicate an oatmeal pancake that a restaurant here serves without much luck. I cannot make good looking pancakes, I actuallty made it a “food resolution” for this year:learn to make (not burn) pancakes..Yours look great, of course. Oh, I’m sorry, I wasn’t able to read the text as my jaw dropped at that awesome picture! fan freakin tastic 🙂 mmmm, i haven’t had pancakes since a couple days after christmas… might need to make them again soon! Such elegance. Gourmet pancakes. You never fail to impress Kevin. Kevin! These look so yummy I just want to dive right in! I can just imagine the wonderful smell of these pancakes. Looks delicious. a very rich and pretty pancake!! Hey Kevin – you are an inspiration on all meals, breakfast too! Oh, how scrumptious looking! Fantastic! I live in a pancake-lovin’ household. I like how you’ve added a bit of roughage in the mix with the oatmeal. Looks delicious! You always manage to make pancakes look so beautiful. I need to go get some breakfast. Yum! you are a tease! these are incredible looking! I love this. It’s like a test of how much apple you can fit into a plate of pancakes. It sounds delicious. Hi Kevin, followed your blog for a couple of weeks now, and I really like your recipes. I’m a vegetarian, and you have lots of gorgeous looking and sounding veggie recipes. Thanks! Have not yet tried any of them, but this weekend I will make one of your farro-salades (if I can find Farro, otherwise I’ll maybe use semi di orzo) and probably your apple-pancakes. WOW…they are making me hungry! oh goodness. looks so delicious! Wow, Kevin that breakfast will last me until supper time….delicious stuff!!! I would love a plate please! These are perfect looking pancakes. The roasted apple sauce is a great idea. Oh my! Oh my! This has got to be on my to make list! Gorgeous! I love apples and cinnamon together and making apple-cinnamon pancakes must be the ultimate comfort food. Wow, these really look so good. Your photos are always so drool-worthy! Now I want pancakes! Wowowow i would polist the whole plate if you serve them to me. I’m so drooling right now! This is so great Kevin! I would have this everyday of the week for breakfast!! These look terrific. I love adding fruit to my waffles, and it should be equally wonderful in pancakes! What time is breakfast!! OMG these look wonderful!! The pancakes look so good. I would love them some morning! YUM! I’ve made it a point to start baking with more whole grains, and these pancakes will certainly be added to that repertoire. You know, that breakfast barely resembles what I had this morning: a grapefruit. It’s a cruel world. Wow! That looks great, I would give anything to be eating one of those right now! I always make big breakfasts on weekends. I hope the week hurries along so I can try these! They look amazing! I’ve had apples on pancakes, but not in pancakes! What a great way to kick off your morning! Try adding some boiled cider (availble at http://www.bakerscatalog.com). It give apple pie a real punch. Love your site. I want breakfast now! Those look really tasty Kevin. We love pancakes during the w-end. This looks like a hit. I would add a dollop of whipped cream on top. very filling and healthy breakfast there! I have been craving pancakes lately and this isn’t helping, these look soo good! 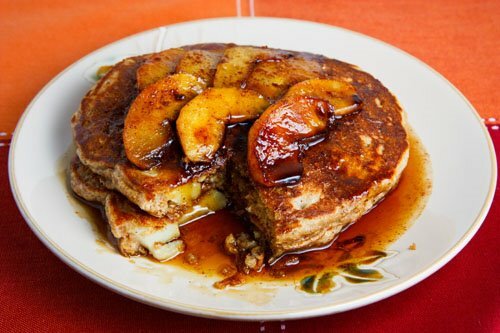 I have never tried putting apple sauce into pancakes before, this is something I have to try. These are my kind of pancakes! Love that you used whole wheat flour and oats!!! I bet they were delicious with that fruit! This looks like something you’d get in a fancy schmancy pancake house – only much,much better! Kevin, these look so amazing! I can’t wait to try them. Oh Kevin… That looks like a reason to get out of bed in the morning!! wow. those oatmeal pancakes look really really good! apples and cinnamon are a classic combo. Is there any better combination than oats, apples and cinnamon? these look heavenly- makes me wish i hadn’t just finished eating breakfast. those are some decadent pancakes!! I’m drooling over these pancakes! Great job . . . I just bought a bag of oat flour for bread. I have to give your recipe a try with it. Its breakfast time & I am literally drooling. What a dish what a shot! I could actually use this for any meal. Oh my god, this looks great! One of these days I’m going to make pancakes. These look so delicious!! Wish I had had these for breakfast! I’m always looking for good breakfast recipes. I think I might try this one soon. I made this pancakes this morning. I really enjoyed every bite! Can I use steel-cut oats instead of rolled oats? Steel cuts oats can be used and they would need to be cooked first. Enjoy!